Regulatory affairs for medicinal products or medical devices is a complex process. Each country in Europe has its own specific requirements related to medicinal products, medical devices or food supplements. Knowledge of such county-specific regulations is crucial to get marketing authorization or to solve other regulatory problems smoothly and quickly. It helps also to foresee and prevent from potential problems by choosing the right solutions in advance not during the authorization process when all problems and clarifications result in huge delays. Our services help to avoid such dead ends which is of great importance to company marketing plans. Our company consists of people with high practical experience in EU regulatory affairs gained in Polish Authority and consulting companies therefore we are able to help you with smooth marketing authorization of medicinal products, medical devices or food supplements and with all processes related to maintenance of marketing authorization (variations, renewals etc.) as well as with any other regulatory affairs issues in Poland and in Europe. 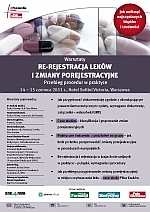 We are former Polish Authority experts who assessed scientific dossier in MRP, DCP and central procedure, we were involved in preparation of Polish pharmaceutical regulations and we know that no training can give you knowledge of rules not described in the law, local interpretation of EU guidelines etc. Only practical experience in local law, knowledge of additional rules and requirements, EU guidelines interpretation and knowledge of the way how local authorities really work assures efficient services. We know the reality. Therefore besides common regulatory affairs services for medicinal products, medical devices and food supplements we can help you with scientific dossier preparation, liaison with authorities, preparation of responses to the formal and scientific List of Questions/Deficiencies. We can foresee what will happen which in turn help you plan your activities.